Annabel’s is the latest brainchild of the Swedish interior architect, who now splits his time between studios in London and New York. Known for his maximalist sensibilities, Brudnizki dreams up fantastically opulent hospitality and residential interiors that defy convention and seamlessly layer references from different time periods. He recently helped GKV Architects restore New York’s Beekman Hotel, instantly transforming the derelict Gilded Age marvel into one of the city’s chicest destinations. (It even received an Interior Design Best of Year award in 2016 for Hotel Transformation.) Upcoming projects include a total overhaul of the Flag and Rooftop suites at the Grand Hotel Stockholm—Sweden’s only 5-star deluxe hotel—and The Surf Club Restaurant by Thomas Keller in Miami. 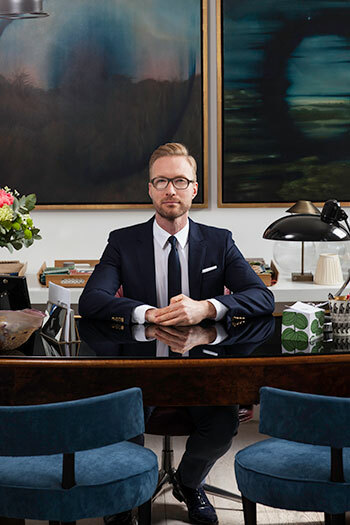 Brudnizki sat down with Interior Design to share how his Stockholm upbringing influenced his design eye and why his spaces evoke emotion. Interior Design: How did growing up in Stockholm shape your design sensibilities? Martin Brudnizki: I grew up in a creative home, with my mother working as a fashion stylist and my father as an engineer. The combination of their two jobs and personalities helped shape me today as a designer; I was sensitive to my mother’s ability to effortlessly pull together a room with objects, artwork, and color, while my father’s methodical approach to how things work and should be put together technically grounded me with a fundamental understanding of engineering. I actually ended up studying economics at university and knew it wasn’t for me. But after meeting up with a friend who had been studying design in London, I thought to myself, “I can do that!” and as they say, the rest is history. ID: You started your practice in London, but opened an office in New York in 2012. What fueled this move? MB: Much like London, New York is a center for creatives, and MBDS was taking on more projects worldwide. So it seemed like a natural progression to spread our wings further and establish ourselves across the pond. I now split my time between the two studios; it has given us the flexibility to take on more projects and in locations we have never worked in before. 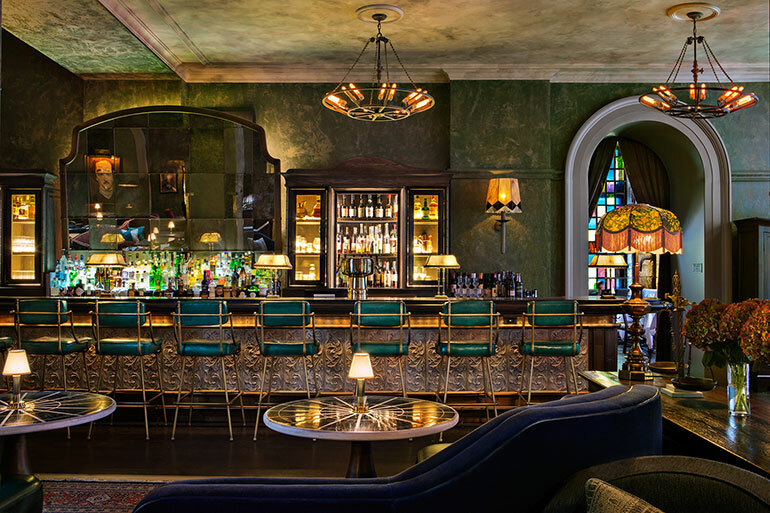 The Beekman Hotel’s bar. Photography by James McDonald. ID: What were the most challenging and rewarding parts of restoring the Beekman? MB: The Beekman was an extraordinary project to take on. Temple Court, where it’s located, was built in 1881 in the American Queen Anne style. It was in complete ruins with various areas covered up when we first saw it. As soon as the incredible nine-story atrium and glass skylight were revealed, we knew this needed to become a central aspect to the hotel’s design. We sensitively restored much of the original architecture and features so as not to lose the building’s history, and contrasted this with eclectic furniture, rich objects, and artwork that helped bring everything together. 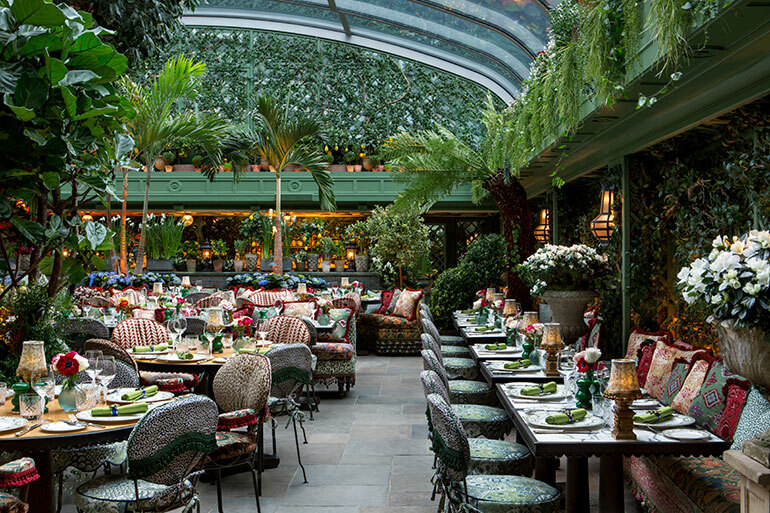 Ornately patterned chairs, complete with pompom tassels and trims, furnish the Garden Terrace at Annabel’s. Photography by James McDonald. 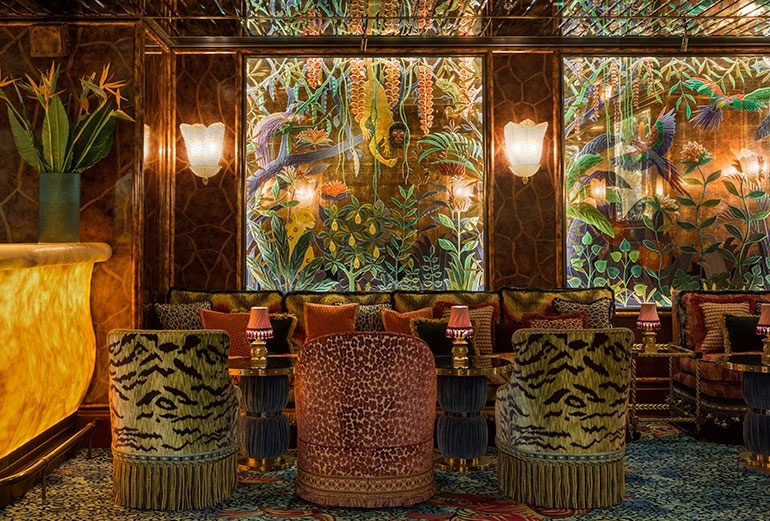 ID: Equally as extravagant is Annabel’s, the London social club you recently reimagined. Tell me more about that. MB: Annabel’s is an iconic London private members’ club that has a rich social and cultural history, but was moving two doors town to 46 Berkeley Square. Redesigning it was a great honor! We had so much fun and the result is our most creative. We channeled the ways flora and fauna have been depicted throughout history and art to create something that feels eccentric, exciting, and fun. ID: You’ve been quoted as saying “When I design a place, I think about the emotion that will be provoked when you walk in.” What emotions do you aim to evoke with Annabel’s? MB: I wanted Annabel’s to be a place where you just know you’ll have fun. It’s opulent and crazy and makes you want to put on your best outfit and have a great night with friends. It’s very hedonistic. 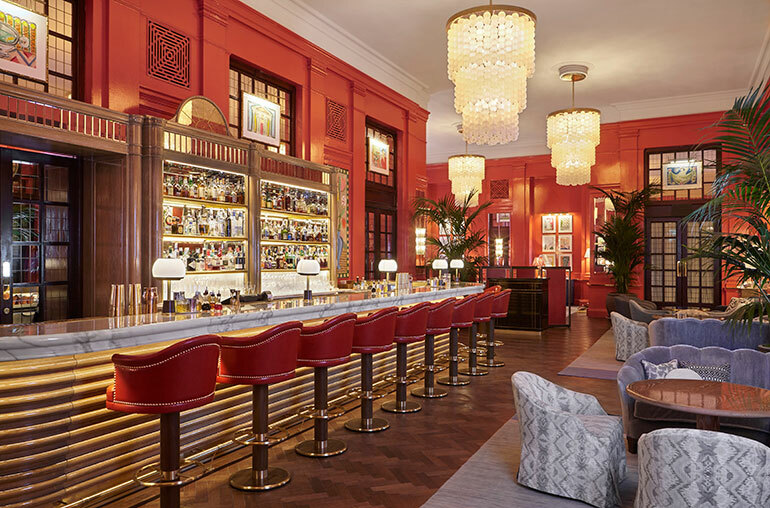 The Coral Room bar blends Murano glass chandeliers, antique mirrors, brass detailing, and vivid coral walls to reflect the heritage of London’s iconic Bloomsbury Hotel. Photography courtesy of the Bloomsbury Hotel. ID: What inspired you to establish And Objects, your product design studio? MB: I established And Objects in 2015 with Nick Jeanes, my long-term friend and former design director. At MBDS, we were constantly tweaking pre-made furniture, fabrics, and objects to fit our exacting specifications. We decided there was a niche in the market to create our own pieces and so And Objects was born. We now design our own line of objects—from leather-wrapped bar stools to sleek chrome desk lamps—as well as collaborate with brands including Urban Electric Co., George Smith, Drummonds Bathrooms, Christopher Farr Cloth, and Porta Romana. ID: What are a few upcoming projects? MB: My first U.K. hotel, University Arms in Cambridge, which draws inspiration from the collegiate town and its unique heritage, is opening this summer. We worked with John Simpson Architects to create a destination that feels as though it’s always been there. My New York studio has also been busy completing the the Surf Club restaurant by Thomas Keller, which sees the revival of the iconic Miami members’ club with a restaurant by a renowned chef. I’m also excited to see the result of our public spaces and villa at Eden Rock St. Barthes after it was destroyed by Hurricane Irma. 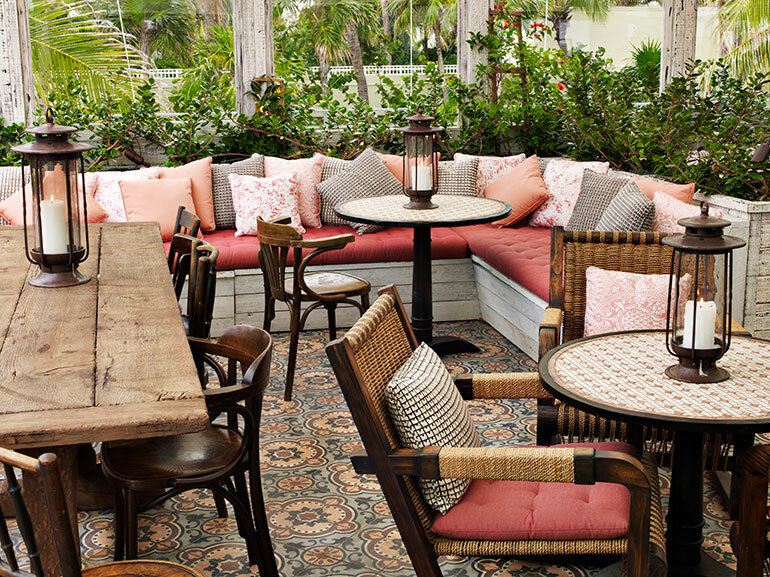 At the Soho Beach House Miami, a faded color palette evokes maritime and Old Havana. Photography by James McDonald. MB: I get asked this frequently and can never pinpoint a defining project. But there have certainly been projects pivotal to the studio. Scott’s, the iconic London seafood restaurant, gave us the opportunity to work with Caprice Holdings, which developed into a great relationship. Soho Beach House in Miami was our first hotel and U.S. project. Likewise with the Beekman—it was such a beautiful building and really allowed us to create something amazing out of a ruin. And finally, Annabel’s was a once-in-a-lifetime opportunity. It gave us so much creative freedom. MB: It’s impossible to choose. If I have to pick, I love working with marble and include it in every project. It’s tactile, elegant and sensual. MB: I’m lucky that I get to travel an awful lot and meet so many interesting and varied people. I’m rarely bored!